I’m not even kidding. Manneken Pis (possibly the best name EVER), or Petit Julien, as he’s also known, occupies a tiny space in the corner of Rue de Chene. He stands at 61cm tall. He’s sculpted in bronze and spends his days peeing into the basin of the fountain below his feet. It’s hard to describe just how popular the little man is. As you approach him, you will undoubtedly become embroiled in the scrum of people taking his photo. He also gets dressed up quite often, depending on what the city is celebrating. He has hundreds of outfits to don on any given day. Manneken is by far the most famous statue in the city, but he’s not the only one. In 1987, in the interests of gender equality (and why not?…) Manneken Pis was joined by a sister, Jeanneke. She’s not next to him, but just a short distance away, down the side of the world-record holding Delirium Bar. Jeanneke is squatting (obvs) and not *quite* as appealing (I hesitate to use the word ‘attractive’ in terms of peeing statues, so let’s go with ‘appealing’…). She also attracts a crowd, albeit not as large as her sibling. However, I often think it might be because she lives outside one of Brussels‘ most famous bars. Regardless, she’s located behind a steel, padlocked cage for reasons we probably don’t really want to explore. Jeanneke is continually active on the Impasse de la Fidelitie. So, I know what you’re thinking. The Peeing Trio of Brussels is the name of this post and you’re desperately trying to work out who the third one is, right? Well, wonder no more, good people of…where ever you’re from. Let me tell you that the final peeing statue isn’t human: It’s canine. Yes indeed. The last piece of this particularly bizarre puzzle is Zinneke Pis, the peeing pooch. He’s literally the best peeing dog I’ve ever seen. Even better than *actual* peeing dogs. Het Zinneke, the beautiful bronze mongrel, has cocked his leg against a bollard at all times. Visitors can see him on the corner of Rue des Charteux 35, next to the Halles Sant Gery. The same man responsible for Jeanneke created Zinneke. However, this doggo is the least popular and well known of the trio. His leg is cocked a little further out of Brussels’ centre. Het Zinneke is also the only one of the three statues that can be touched. This is obvious from the fact that his snout and tail have turned gold from all the pawing of interested passers-by. No one who knows me will be surprised that Zinneke is my favourite from the three statues because he’s a dog. Little peeing boys and girls I can live without, but a peeing dog? I’m so here for that. 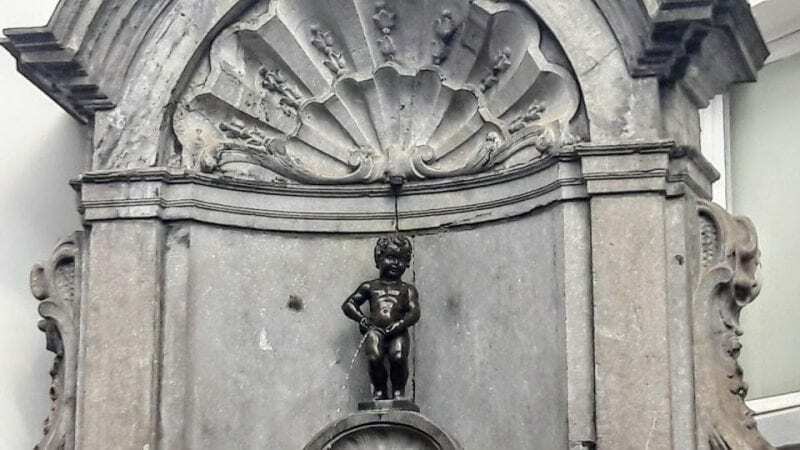 Have you visited the famous peeing trio of Brussels?